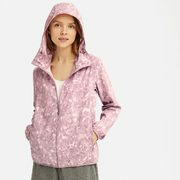 Uniqlo Uniqlo Limited-Time Offers: Women's Pocketable UV Cut Printed Parka $29.90, Men's Pull on Jogger Pants $19.90 + More! New Limited-Time Offers! Save on some new wardrobe updates with help from the newest Limited-Time Offers from Uniqlo! These deals are available both in-store and online, and include discounts on styles for the whole family! Check out some of this week's offers below. Most offers are available online and in Uniqlo Canada stores through April 14 unless otherwise stated. Online orders over $49.90 ship free, or you have your order shipped to your nearest store, no minimum required.